The Law Foundation of Ontario’s Connecting Articling Fellowship (CAF) program aims to increase access to justice for linguistic minorities and rural and remote populations. 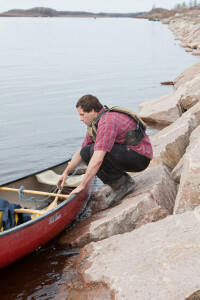 CAF articling students are hosted by community legal clinics and they serve linguistic minorities in their own language (other than French) or work in a rural or remote area of Ontario. The CAF program was established as a recommendation of the Foundation’s Connecting Report and is based on the belief that people should receive legal information and services in their first language wherever possible and that clients in rural and remote areas should have, where possible, direct access to legal practitioners. The CAF program began in 2009 and will conclude in 2019. 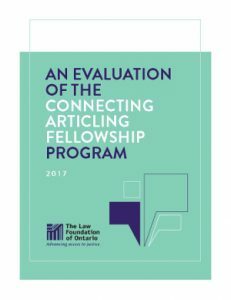 In 2017, the Foundation released an evaluation of its Connecting Articling Fellowship (CAF) program. It found that the program had a positive impact on meeting community needs and it provided high quality training to articling students. We asked the directors of host clinics, current and former articling students, and those engaged in articling and licensing for their feedback on the successes and challenges of the CAF program. We believe their insight, coupled with the analysis of the CAF program contained within the report, can be a valuable resource to help those who are interested in how to use articling and experiential learning to improve access to justice. The evaluation process began in 2016 and explored the CAF program overall, with a focus on outcomes. It also looked at how changes to the lawyer licensing landscape have impacted the program. The evaluation consisted of interviews with host organizations, past and current Connecting Articling Fellows, and those knowledgeable about the lawyer licensing landscape. It also included a review of program reports provided by the host organizations and participants over the years. The evaluation furthers our progress on achieving our priorities set out in the Foundation’s Strategic Plan 2016-2020 and specifically relates to our goal of better understanding and communicating the impact of our funding. While the Foundation funding of the CAF program ends in 2019, the Foundation will continue its work to help those who experience barriers to access to justice, particularly linguistic minorities and rural and remote residents of Ontario. For information about our continuing support of the Connecting Project, please visit our Connecting Project webpage. For a list of all grants made by the Foundation, please visit our Grants Made webpage.